Hi, I am interested in your 1964 Shelby Cobra (stock #5059-CHA) listed on Autotrader for $51,995. I'd like to get more information about this vehicle and confirm its availability. When a car is built from scratch you want it to be a labor of love. 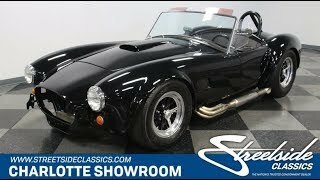 So youll enjoy diving into the details on this 1964 Shelby Cobra Replica. Beneath the classic body is a powerful stroker V8 and full custom tubular racing chassis like youve never seen before. This one has the perfect look to be an intimidating machine. An all-black body, black roll hoop, black quick-jack bumpers, and black wheels gives this a great midnight level of aggressiveness. It also draws your attention to the remaining bright items like the wicked side pipes. While the full package has the exact style you want in a performance car, dont forget to really look at the quality, too. The black paint has a high-gloss finish and the sunlight rolls evenly over the Cobras iconic curves. It signals to you that some took some real time on this build, and you see even more proof beneath the surface (more on that in a moment.) The interior is built for race-ready performance. Leather bucket seats, a racing harness for the driver, and a grippy Momo steering wheel give you the right tools for success. The aluminum dash is filled with professional grade AutoMeter Pro-Comp readouts to keep you fully informed about whats going on under the hood. You can instantly see this engine bay was built for true performance work. Thats why the functional hood scoop is feeding the four-barrel carburetor and the 331 cubic-inch stroker V8 underneath. This is a big power machine, and the growl of the side pipes lets everyone know it. But more than just powerful, this is a special car because it was a five-year build that didnt come from a kit. Instead the chassis was carefully crafted, including mockups and stress tests. Once the design was perfected, a tubular steel space frame chassis was created in the kind of tradition usually reserved for amazing classic racecars like the Maserati Birdcage. So this is one of the most interesting and well-prepped Cobras you can get your hands on right now. And because its a custom engineering labor of love, it also has the right components to keep you in full control. That means a four-speed manual transmission, a large fuel cell over the rear end, and four-wheel disc brakes. Plus, not only do you get a fully adjustable fully independent suspension, but also thats a desirable Ford 9 rear with inboard brakes. The sale comes with creation photos, build receipts, service manuals, and a dyno sheet. Specialty machines like this rarely leave their creators hands, so dont miss a rare opportunity.